An elaborate dress whose layers of ruffles taper to a train, the bata de cola adds much flair to the traditional Spanish dances being taught by instructor Linda Vega. As her young performers flounce across the white-walled room in graceful formation to prepare for their annual Old Spanish Days performances, the colorful gowns trail on the floor behind their elaborate footwork, stirring up the Fiesta spirits of yesteryear — and quite a bit of dust. 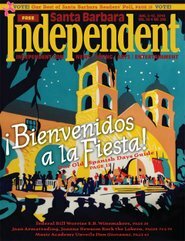 This entry was posted in Fiesta 2010, Press Reviews and tagged LV383 on August 5, 2010 by Filmmakers.